Groups for spring 2019 begin April 8th! 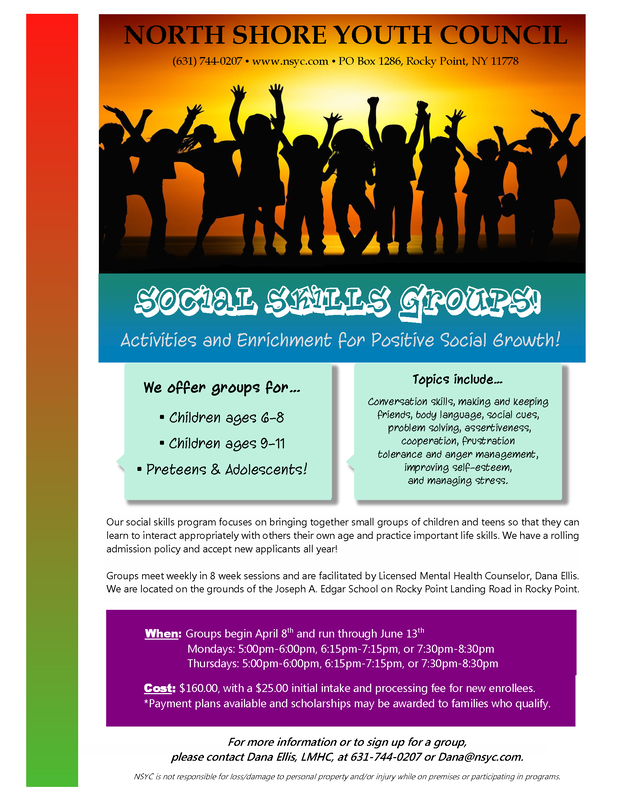 North Shore Youth Council is pleased to offer our SOCIAL SKILLS program in an enjoyable and interactive environment for children and adolescents between elementary and high school age. These small group sessions will enable students to interact and learn new skills within a group of appropriately matched peers. Counselors will offer feedback and guidance to assist the child in navigating their social challenges. Skills are taught through discussion, scripted role-playing and engagement through facilitated games and activities. Half way through the program, parents will be offered an optional 1:1 parent meeting where they will discuss their child’s participation in the program, areas of strength, areas where growth is still needed and how to integrate this social learning into other areas of the child’s life at home, school, and extracurricular activities. Each group session is one hour in length and will include a small snack, conversation, and activities and games to promote social learning. If you have any questions about the program or if you have something specific you would like us to target with your child please contact Dana Ellis, M.A., Program Coordinator of the social skills program, at (631) 744-0207 or by email at Dana@NSYC.com.